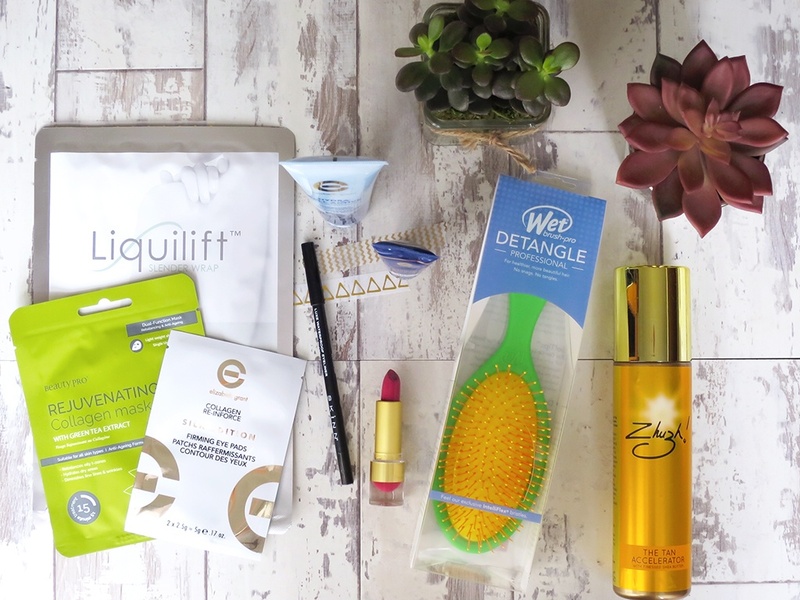 I’ve been trying a selection of beauty products which are available exclusively in the UK through Ideal World TV, who have an extensive range of makeup and skincare brands available on both their TV Channel & online shop. I have been aware of them for some time now but they’re constantly adding new product lines and always offering incredible deals. I thought I would share with you a few of the products, so you can get a little insight into a couple of the brands available. These come in a pack of 4, you place the wrap around the target area and they say you will see the best results if you’re able to leave it on overnight (not sure how comfortable that would be). These wraps are designed to smooth, tighten, hydrate skin leaving it more slender. These contain skin-loving ingredients including, Seaweed, Ivy, Rosemary, Jojoba, Menthol and a range of essential vitamins. I love a face mask but not sure how I feel about a body wrap. I guess the results may be short-lived, I haven’t used this yet & if I am honest I’m not overly excited to. Now, this is 100% more my cup of tea. Sheet masks are so popular right now and I love using them. If you’re new to the craze that is the sheet mask, they’ve been hugely popular in Korea for years and are a one use cotton / cloth mask saturated in powerful ingredients to help keep your skin looking its best. There are so many varieties on the market and are specific to your skin needs. This one from Beauty Pro is formulated with Green Tea Extract which combats oil, rehydrates skin and gives your skin a beautiful healthy glow. This one has a great amount of liquid which feels cooling and relaxing on the skin, I left this on for a little over 20 minutes, my skin felt instantly hydrated and did look fresher. These masks are great to travel with as they’re compact and help refresh skin after flying, or during your long haul flight if you’re brave enough to apply it. These come in a pack of 5 individual masks. These eye pads are on a similar vein to the sheet masks but these are specifically a treatment for your under eye area. These are so easy to apply and give an instant result to puffy tired eyes. I leave them on for as long as I can, to get every ounce of benefit out of them. They’re great to use before an important event or again after travelling and help revive and brighten your under eye. After I take them off I pat in what product is left under my eye. You get 12 sets in each pack. This is a nice rich but lightweight hand cream it helped hydrate my hands and stop them looking dry. Its lightweight formula sinks in quickly but leaves hands feeling protected. You can never own too many hand creams, I have them stashed all over the place but especially in my car and handbag. I have yet to put this to the test but Glycolic Acid products are really popular in the beauty world right now because of its exfoliating and skin rejuvenating qualities. This mask is a creamy, hydrating clay mask and loaded with 10% glycolic acid and Torricelum. The mask helps draw out deep impurities, encourages healthy new skin cells to reveal themselves, tightens pores, reduces lines, and moisturises. So with all those potential benefits I am excited to use this. I have also been trying the Skinn Luxe Waterproof Eyeliner in Rich Black. This wasn’t too smooth to apply and I did notice it feathered out in the fine lines on my eyelid. I will say the colour is very pigmented and once it dries there is no budging, it stays in place all day. So if you want to smoke this out you have about 2 minutes before it won’t move. It didn’t irritate my eyes but you will need a good cleanser to get this waterproof liner off. These brushes are a must of you struggle with knotty hair after washing, these are specifically designed to be used on wet hair. Wet brushes come in a range of sizes and styles, this one is neon green & yellow and the rubber coated handle for grip, the super thin, flexible bristles detangle tough knots with ease. The great thing about these brushes is they doesn’t tug, snap or damage your hair so you can detangle it knowing your hair isn’t getting damaged. Also because they’re so gentle they prevent split ends. If you haven’t already browsed the beauty department on Ideal World TV make sure you pop over. You might discover some interesting new brands and great offers.